•Windows Store Apps: added API to get application activation arguments sent by secondary tile, toast notification now can send activation arguments. •Windows Phone 8/+ Windows Store Apps: Transferred Trial API from UnityEngine.Application to UnityEngine.Windows.LicenseInformation class. •Windows Phone/+ Windows Store Apps: Exposed application trial API. •Windows Store Apps - Windows 8.1: Input callbacks will now be processed on application thread instead of UI thread, thus reducing input lag. •Windows Store Apps - Windows 8.1: Will use Direct3D low-latency presentation API http://msdn.microsoft.com/en-us/library/windows/apps/bg182880.aspx#five, this should improve input latency. •Windows Store Apps & + Windows Phone: Windows 8 requirement to build for Windows Phone/Windows Store Apps is always listed in build settings if it isn't met. •Windows Store Apps: Added Master configuration to the exported solution, so now there will be three - Debug, Release, Master like on Windows Phone 8. Master configuration should be used when releasing the game. Release configuration is the same as Master, but has Profiler enabled, that's the only difference. •Windows Store Apps: Animator.GetCurrentAnimationClipState, Animator.GetNextAnimationClipState should work now. •Windows Store Apps: Added UnityEngine.WSA.Application.windowsActivated event, which can be used for capturing events when snapping begins and ends. •Windows Store Apps: Windows 8.1 support. •Windows Store Apps: Cloth is supported now. •Windows Store Apps: Editor will check if plugins used by Editor and Windows Store Apps are compatible, for ex., it will check if assembly version matches. •Windows Store Apps: Editor will perform a check if user is running under Windows 8 or higher, if not Build buttons will be disabled. 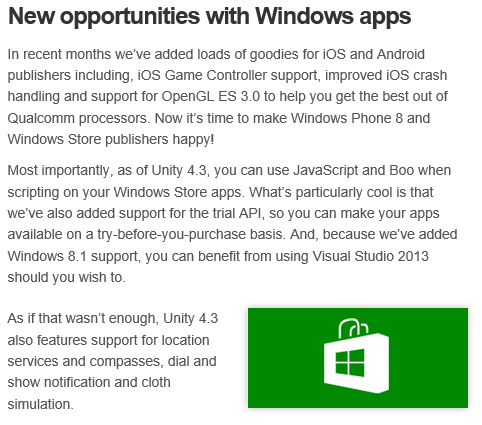 •Windows Store Apps: Unity splash screen will be shown if user doesn't have a Pro license. •Windows Store Apps: Added UnityEngine.WSA.Application.windowSizeChanged event, which will be invoked when user resizes the window, for ex., when performing snaping. •Windows Store Apps: Implemented LocationService and Compass. •Windows Store Apps: Compilation Overrides will only affect C# files not located in "Standard Assets", "Pro Standard Assets" or "Plugins" folders. •Windows Store Apps: Managed-To-Native functions now use Platform Invoke to perform interop, performance should be better now. •Windows Store Apps: New APIs. UnityEngine.Windows.File, UnityEngine.Windows.Directory for accessing directories and files. UnityEngine.WSA.Application for invoking calls on different threads. •Windows Store Apps: Resources.UnloadUnusedAssets should work correctly now. •Windows Store Apps: When generating C+/C# solution, Mixed Mode debugging will be enabled by default. •Windows Store Apps: Make sure gui password field is drawing mask char, even though os keyboard returns clear text. •Windows Phone/+ Windows Store Apps: Fixed unity player crashing if fields in user scripts were emitted with #if UNITY_EDITOR precessor flag. •Windows Phone/+ Windows Store Apps: Reference ReWriter will now correctly find replacement method with param arguments if original is not available in the target framework. •Windows Store Apps: Fixed out of bounds error while batching 2D sprites. 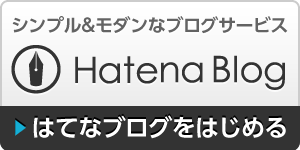 •Windows Store Apps: fixed parameter marshaling of type 'char' in UnityEngine API, this fixes following Unity functions - Event.character, Font::HasCharacter, Font::GetCharacterInfo. Because of this bug chinese, russian texts in some cases were being displayed incorrectly. •Windows Store Apps: PlayerPrefs will be loaded before calling OnEnable function. •Windows Store Apps: Screen.orientation will work correctly (was fixed in 4.3 a1). •Windows Store Apps / Windows 8.1: Fixed regression from 4.3 b3, any touch or mouse input won't longer hang the application. •Windows Store Apps / Windows 8.1: IDXGIDevice3::Trim will be called on application suspend event, WACK requirement. •Windows Store Apps: Fix AssemblyResolutionException during game postprocess when code references members from Windows namespace. •Windows Store App/+ Windows Phone: String with unicode symbols (for ex., Chinese) will be correctly serialized. •Windows Store Apps: WWW will correctly load files via file:/// protocol, and won't require internet capability to be enabled. •Windows Store Apps: C# files located in Plugins, Standard Assets or Pro Standard Assets won't be compiled against .NET Core even if player setting are set to compile against .NET Core. This way js/boo will be able to access classes from C# files, C# files in other locations can be compiled against .NET Core depending on Player Settings. •Windows Store Apps: RequireComponent works now.